“If we do not have a deep foundation of faith and a solid testimony of truth, we may have difficulty withstanding the harsh storms and icy winds of adversity which inevitably come to each of us. “How Firm a Foundation,” Liahona and Ensign, Nov. 2006, 62. “Becoming Our Best Selves,” Liahona and Ensign, Apr. 2006, 3, 5. “Your Patriarchal Blessing: A Liahona of Light,” Ensign, Nov. 1986, 66. 16-stake fireside, Brigham Young University, Nov. 16, 1986. Teaching, No Greater Call states: “A skilled teacher doesn’t think, … ‘What will I teach today?’ but rather, ‘How will I help my students discover what they need to know?’” (, 61). 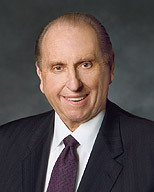 To help individuals learn from this article, consider providing them with paper and pencils and giving them time to read President Monson’s words and write down truths they discover about being spiritually prepared. Younger children could draw pictures about what they learn. Consider having them share what they have written or drawn.